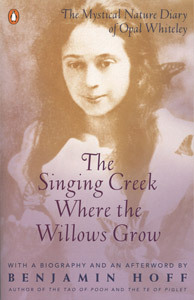 Benjamin Hoff is the author of The Tao of Pooh and The Te of Piglet, both of which explain the Chinese philosophy of Taoism through the characters created by A.A. Milne, and The Singing Creek Where the Willows Grow, his biography of fellow Oregon author and charismatic nature teacher Opal Whiteley. All three books were Book-of-the-Month Club selections. The Tao of Pooh and The Te of Piglet were also selections of the Quality Paperback Book Club. The Tao of Pooh –- an international bestseller and the first Taoist-authored book in history to appear on bestseller lists –- was on The New York Times’ bestseller list for 49 weeks. 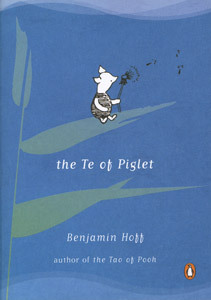 Its international-bestseller successor, The Te of Piglet, was on New York Times for 59 weeks. For years they have been used as high school and college texts for classes in a wide variety of subjects, including science, business, philosophy, literature, and world culture. They have been publicly endorsed by notables such as English pop-philosophy author John Tyerman Williams, American marketing communication guru Michael Ray, Wall Street investment counselor and author Bennet Goodspeed, and popular screen actress Julia Roberts. In 2010, as part of the publisher’s 75th anniversary celebration, Penguin Books selected The Tao of Pooh to be one of the 75 books featured in the house’s printed promotion and public displays. The descendant of two family lines of artists, engineers, and explorers, Benjamin Hoff has been a writer, an investigative photojournalist, a tree pruner, a songwriter, and a recording musician and singer. He has studied architecture, music, fine arts, graphic design, and Asian culture –- including Japanese Tea Ceremony (third certificate level), Japanese fine-pruning methods (two years of apprenticeship), and the comparatively esoteric martial-art form of T’ai Chi Ch’uan (four years of instruction, including a year of Ch’i Kung). He attended Sylvan School, West Sylvan Middle School, Benson Polytechnic, Lincoln High School (the latter two in Portland), the University of Oregon in Eugene, the Museum Art School (now the Pacific Northwest College of Art) in Portland, and The Evergreen State College in Olympia, Washington, from which he graduated with a B.A. degree. From his father –- a scholar and collector of Asian art, and a close friend of the landscape painter Chiura Obata –- he gained a familiarity with and a love of Eastern ways; from his mother’s English/Irish/Welsh family background, he gained a familiarity with and a love of British literature and culture. These East/West influences eventually came together in the writing of The Tao of Pooh and The Te of Piglet. Benjamin Hoff enjoys playing classical guitar, composing music, photographing nature, and “improving things.” At present, he is designing a line of revolutionary solidbody electric guitars and speaker cabinets. Benjamin Hoff is listed in Who’s Who in America, and is one of only 55,000 individuals selected from the populations of 215 nations and territories to be listed in Who’s Who in the World. In April 2018 he was awarded the 2018 Albert Nelson Marquis Lifetime Achievement Award. This award is bestowed upon less than 5% of Marquis Who's Who biographical listees. Benjamin Hoff has not authorized any e-book editions of any of his books. Any company or organization that states or implies that it has his authorization for its e-book editions of his work is lying as well as stealing. Anyone purchasing or downloading any e-book editions of these books is violating the author’s rights. Thanks to a provision of revised U.S. copyright law, I will be recapturing the U.S. copyright for The Tao of Pooh as of December 15 of this year. I thought it best to inform the Trustees and Curtis Brown as to why I'm taking this action, so there will be -- I hope -- no misunderstanding. (1) When Penguin chose The Tao of Pooh to be one of the 75 books representing the publisher for their seventy-fifth-year anniversary celebration, I received no congratulatory letter informing me that the book had been chosen. Nor did I receive any of the memorabilia (poster, etc.) made for the celebration's public displays and press releases. When I read or heard about the events, I wrote to Penguin asking for a poster. I was sent a vinyl shopping bag -- the only thing, I was told, that had been left over. 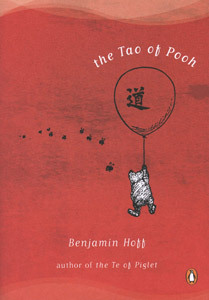 (2) Over the years I have requested from various people at Penguin a list of the books and magazines that have quoted from The Tao of Pooh -- which I've been told is one of the most-quoted-from books in recent times. The response each time is that to grant my request would be "too much bother." (3) For a quarter-century -- since 1993, when The Tao of Pooh and The Te of Piglet were simultaneously on The New York Times' bestseller list, for which I was listed in the American Booksellers Association newsletter in 1994 as one of the top-selling paperback authors of the year, yet received a suspiciously small amount of forwarded reader and professional mail (requests for public appearances at book-signings or other events) -- I have voiced my concerns about what others in the book-business have told me is an impossibly small quantity of mail. For six years and three months now I have received no forwarded mail whatever -- no reader-letters, no books to sign or endorse, no requests for public appearances, etc. When I placed a notice to that effect on my website, along with a Post Office box address at which website-readers could reach me, I received more mail in the year or so of the notice than I had received for many years by way of Penguin. Some readers wrote to me at the P.O. box saying that they had sent copies of their letters to me in care of Penguin so that I could see if they were forwarded to me. Not one of the letter-copies arrived at my home address, forwarded to me by Penguin. Over the years I have asked various people at Penguin to make a thorough physical search for my missing mail, going beyond the mailroom if possible. Each time my request was dismissed. At first, when I was receiving some mail, I was told, "If you're not receiving much mail, it means not many people are writing to you." When I later pointed out (over six years ago) that I was not receiving any forwarded mail, I was told, "That's because no one is writing to you." Tao of Pooh book sales for the U.S. and beyond are such that only an idiot would believe such a statement. But an idiot is evidently what these people take me for. I have endured enough incidents of mean-spirited treatment including the above during my 36 years with Dutton-then-Penguin to convince me that I must now go elsewhere. That, in summary, is my explanation. P.S. A few days ago I received a letter from Marquis Publications, publisher of Who's Who in America and Who's Who in the World (in both of which I'm listed), saying in part: "I am pleased to announce that you are being considered for the 2018 Albert Nelson Marquis Lifetime Achievement Award.... The Lifetime Achievement Award is bestowed upon less than 5% of Marquis biographical listees." According to USPS Tracking, the above letter was delivered on April 25. As of June 15, I have received no reply. In that case, as of December 15 there will be no U.S. publication of The Tao of Pooh. 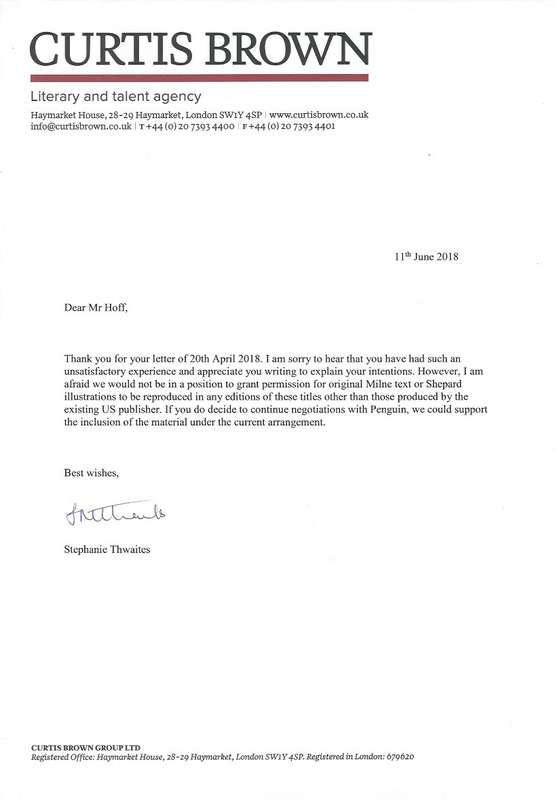 I will not prolong an abusive relationship with a publisher that continues to treat me with contempt. As of August 20th, I have received no reply. The Trustees of the Pooh Properties -- who, it would seem, have no interest in granting me the right to take The Tao of Pooh to a more appreciative publisher -- will lose their permissions-fees payments of 40% of my Penguin U.S. paperback royalties and 33 1/3% of my Penguin U.S. hardcover royalties starting on December 15, when the Penguin U.S. editions become illegal. "Lost Horizons" - an essay on the evolving style of Volvos. "Drive Safer" - an essay on the effects of gadgetry in automobiles. Song lyrics - rewrites and originals. "'Green' Automobile Power" - an essay on our alternative auto-power choices. The Volvo 850 Turbo performance-improvement project. "Ghost Tennis" - a tennis tactics/philosophy essay. A tribute to Clementine E. Hoff, Benjamin Hoff's mother who passed away on March 13, 2012. The mission of the Animal Welfare Institute is to alleviate the suffering of nonhuman animals. Read articles from their Fall 2012 publication here. 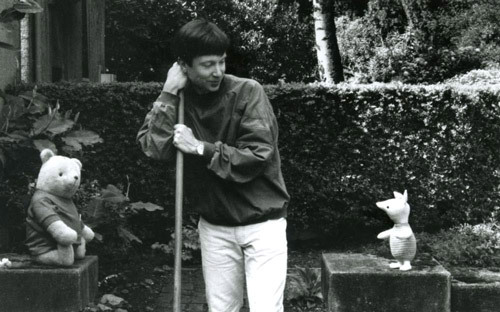 In the late 1960s, Benjamin Hoff helped to form United Travel Service, a unique-sounding rock/pop band. Click here for a link to utsrocks.com, for info on the band and their LP & CD releases.